Spring is coming, a time for renewal, rebirth, and adorable babies! 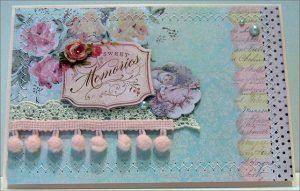 Here is a sweet vintage card that is perfect for a baby shower or a congratulations card. Note that one of the key techniques on this card is sewing. I had never tried sewing on cards before, but man is it easy! Always experiment on a scrap piece of paper first, to make sure that you have the machine configured properly, the right color of thread, and the stitch set that you want. If you don’t have a sewing machine, or it’s too intimidating, there are several other options to get that stitched look! Cut pink cardstock base to 8.5 x 6.25 inches, score at 4.25 of the 8.5 length and fold in half. Cut a piece of the patterned paper to 6 x 4 inches. 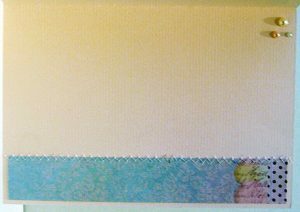 Sew a zigzag pattern using white thread around the border of the paper. To prevent going off the edge, stop the machine when you get to the edge, lift the foot, turn the paper 90 degrees, drop the foot and continue. 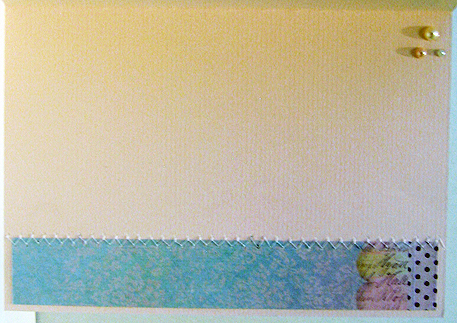 Trim a piece of cream lace ribbon to 4 inches and adhere to the left side of the card. Trim a piece of pink pompom trim to 3.5 inches and adhere to the left side of the card, slightly overlapping the bottom edge of the cream lace ribbon. Put one thin foam square on the scalloped baby sticker, on the upper right corner, and a small glue dot on the bottom left corner, and adhere slightly overlapping the top edge of the cream lace ribbon. Adhere the “Sweet Memories” sticker over the top left corner of the scalloped baby sticker. Place three light blue pearls on the paper: one at the bottom corner of the two stickers, and two in the upper right corner. Adhere the whole panel to the pink cardstock base using foam adhesive. Cut a strip of patterned paper (or use a scrap you already cut off) to 1 x 6 inches and adhere to the bottom of the card inside. Run one zigzag stitch horizontally along the top line of the patterned paper to ground the paper to the card. Add three pearls to the upper right of the card inside—one light blue, one light pink, one cream. So grateful that my girlfriend Jill gave me this post to share with you.